Flying with Air China? Find out everything you need to know about Air China baggage allowance, restrictions, fees and charges. Your carry-on baggage allowance depends on your class of service. Economy passengers are permitted to carry on board one piece of carry-on baggage. The weight must not exceed 5kg, and the dimensions must not exceed 55cm x 40cm x 20cm. First Class and Business Class passengers are permitted to carry on board two pieces of carry-on baggage, each weighing no more than 8kg. Again, each piece of carry-on baggage must not exceed the maximum dimensions of 55cm x 40cm x 20cm. Any carry-on baggage that cannot be stowed in the overhead bins or fit under the seat, or any baggage that is overweight or oversized will be checked into the hold. Fees apply. Economy Class passengers are permitted to check 20kg of luggage. Business Class passengers are permitted to check 30kg of luggage, and First Class passengers may check 40kg of luggage. Infants are given a 10kg checked baggage allowance. Each item of checked baggage must not exceed 100cm x 60cm x 40cm. Checked baggage allowance on international flights varies between routes. Economy Class passengers are permitted to check one piece of hold luggage weighing no more than the maximum 23kg. First and Business Class passengers are permitted to check up to two pieces of hold luggage, each weighing no more than the maximum 32kg. Items must not exceed 158cm in total dimensions. Economy Class passengers are permitted to check up to two pieces of hold luggage, each weighing no more than the maximum 23kg. First and Business Class passengers are permitted to check up to two pieces of hold luggage, each weighing no more than the maximum 32kg. Passengers with infants are permitted to bring one extra 23kg piece. If your baggage exceeds the allowed weight or size restrictions, Air China will apply excess baggage fees. On domestic routes, you will be charged per kg over the allowed limit. The fee is 1.5% of the published one-way Economy adult-fare for the route you are travelling on. On international routes, you will be charged for extra bags over Air China’s baggage allowance, for a bag that is too heavy, or for a bag that is too large in size. To determine this, please visit the Air China website directly. Air China permits a wide range of special baggage on flights. Please visit the Air China website directly for more detail on this. Air China is an undeniably affordable travel option if you are travelling with a small amount of luggage off-peak. However, if you exceed the weight allowance or size restrictions, you may face considerable charges. Thankfully, that’s where My Baggage comes in. My Baggage provides a great low-cost alternative to booking bags on your flight. We offer fast and convenient international luggage shipping services, which allow you to travel hands-free. It means you’ll save yourself some time at the airport – you won’t have any bags to check-in, you won’t have to wait around at the luggage carousels at your destination and ultimately, it’ll be one less thing to worry about whilst you travel. My Baggage allows you to ship a massive 30kg suitcase at fantastic low rates. You can get a free instant quote online to see exactly our cost-effective our service can be. You’ll also have the option to pay extra for even heavier bags, if you need to, and you can add as many items as you like to your booking. 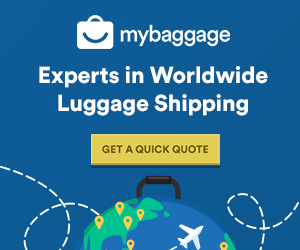 Shipping your luggage ahead allows you to bring more with you than if you were simply relying on a few pieces of checked baggage. Simply book online and My Baggage will collect your luggage and deliver it quickly and safely to where it needs to go. As well as providing a reliable door to door service, My Baggage offers luggage tracking, SMS and email notifications the entire way through. We ship to over 200 countries worldwide, across over 1000 routes. What are you waiting for?